Here are some ethical suggestions for where you can buy beautiful and practical gifts that are not only a gift for the person you are giving it to, but also supporting charities who are doing amazing work alleviating global poverty and supporting those who can’t support themselves, through no fault of their own. Traidcraft – a Christian charity fighting poverty through trade. I run a Traidcraft stall after church services and have found their ordering and delivery really easy – and our congregation love the products! Created Gifts from Tearfund – a Christian charity passionate about the local church bringing justice and transforming lives – overcoming global poverty. New Internationalist – reports on issues of world poverty and inequality, focussing attention on the unjust relationship between the powerful and the powerless worldwide in the fight for global justice. Embrace the Middle East – a Christian charity tackling poverty and injustice in the Middle East. The Leprosy Mission – an international Christian development organisation transforming and empowering the lives of people affected by leprosy. RSPB – save nature while you shop. Oxfam – a global movement of people who share the belief that, in a world rich in resources, poverty isn’t inevitable. It’s an injustice which can, and must, be overcome. Better World Books – buy a gift voucher and, since they donate a book for every book ordered, you’re giving double! Green Gift Company – Fabulous fairtrade, ethical and eco-friendly gifts from around the world and here at home. Great gift ideas that really make a difference! I have ordered some lovely things from here – very straightforward ordering process and they arrived in good time. Natural Collection – good range of presents, as well as ethical food / clothing / toiletries / cleaning products. DoJo Ecoshop – the natural choice for great eco alternatives to everyday goods. A unique range of natural organic mattresses, beds made from sustainably produced timber, organic bedding and towels, greener home and gardening, eco paint, recycled mats for shiatsu and yoga, fairly traded toys and sustainable fabrics, all sourced from ethical suppliers or made in their workshop from organic materials. Greenshop – one of the UK’s leading environmental retailers. Friends of the Earth shop – a range of ethical food / cleaning products / gifts. By Nature – eco fashion / Organic underwear / ethical jewellery / eco gifts / green gift ideas / eco-friendly presents. If you want to give a gift that keeps on giving what about giving an “alternative” gift – who needs another pair of socks or more body lotions anyway?? Have a look at the links below for a gift that matches the interests of the person you are giving it to, there are so many options you are bound to find something; and you get a gift too – the gift of knowing that your purchase is making life better for those people the charities are working with. Toilet Twinning – support the provision of clean and safe toilet facilities and get a photo of the project you have supported to put up in your toilet. We have done this and it is such a great conversation starter! Lend with Care – change a life with a loan. We love giving Lend with Care gift vouchers (starting from £15) to say thank you to friends and family. It’s really easy to do, you can either print the voucher or get it emailed (great for last-minute gifts!). You can customise the voucher, your friend then chooses an entrepreneur to lend to, the entrepreneur’s business grows, and the loan is paid back to your friend enabling them to choose what to do next. It’s a gift that can keep on giving! CAFOD World Gifts – gifts that make a world of difference. They do something no pair of socks can, they change lives around the world. Retrak – a Christian charity working with street children in Africa. Practical Presents from Practical Action – working to provide practical solutions to poverty in the developing world. Shared Interest gift pack – a community benefit society which acts cooperatively and the world’s only 100% fair trade lender. Gifts in Action from Action Aid – working towards a world without poverty in which every person can exercise their right to a life of dignity. Extraordinary gifts from All We Can (previously the Methodist Relief and Development Fund) – gifts that make a real difference in the world’s poorest communities. Us – church-based charity working in direct partnership with people and communities around the world. Save the Children – works in 120 countries, saving children’s lives and fighting for their rights. Living Generously – a meal for a homeless man in London, an operation for a boy with cataracts in Africa, a home for a street-child in Guatemala – who do you want to help today? Choose a life changing gift and Living Generously will send you a gift pack. 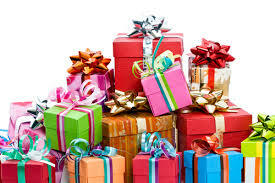 You can also use this site for setting up alternative present lists for occasions like weddings. Cancer Research Give in Celebration – ask loved ones to donate to Cancer Research’s life-saving work instead of gifts and help bring forward the day all cancers are cured.